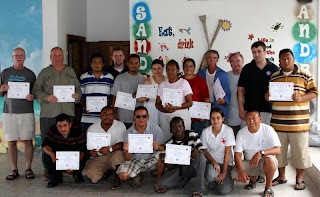 Bandage International in conjunction with Ambergris Caye Emergency Rescue Team (ACER) and the Belize Red Cross presented CPR and First Aid classes on November 3, 4 2009 at The Sandbar. Photos by Charlie Fair of ACER. ACER is available 24 hours a day, 7 days a week, all at no cost to the individual. Great work everyone, thanks for training people to help keep us all safe.